Locate all the best Halloween haunted houses in Pennsylvania at Funtober. Local charity and commercial Halloween haunted houses feature high quality animatronics, fog machines, gory images, scent dispensers, air blasters, and Hollywood like design sets. Pennsylvania is known for some of the scariests haunted attractions in the USA. If you want to find zombies, the walking dead, vampires, demons, devils, and cemeteries you just need to look around the haunted houses in this state. They aren’t downright inhumane. But they will make your visit to a Pennsylvania haunted house pretty miserable if they find out you are from the wrong side of the tracks. Choose among the best haunted hayrides, haunted houses, haunted corn mazes, haunted walking trails and Halloween entertainment. 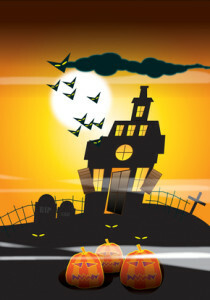 We list all the local Halloween haunted houses near you. We have separate attraction links and listings for haunted houses USA, haunted corn mazes, haunted trails, haunted zombie paintball, haunted forests, haunted hayrides, and ghost tours. This fantastic haunt opens their season on September 21st. Advertised as America’s most horrifying motel, Bates Motel has been operating as a haunted attraction for over 28 years. It is truly one of the great haunted attractions in America. Bates Motel built detailed Hollywood styled movie sets such as putting a New England type church onsite. They have other 100 foot scenes, amazing pyrotechnics and around 100 actors. Save money and purchase the combo ticket for $40. Individual tickets to the Bates Motel, Corn Maze or Haunted Hayride run $15, $15, and $20 respectively. Child ticket prices are less. Doors open at 6:30 and close at 10:30 pm on Friday and Saturday. Doors close at 9:30 pm on other nights. Bates runs most nights in October beginning September 30th. Bates has over 34000 Facebook likes. Opens this year on October 5th. Operating for over 20 years, Castle Blood is “Pennsylvania’s most unusual haunted attraction”. Expect to find lots of vampires, scenes of the dead, and supernatural creatures. Tickets are $25. Castle Blood is open every Friday, Saturday, and Sunday nights in October. Castle opens at 7 pm. Ticket booth closes at 11 pm on Friday and Saturday or 9 pm on Sunday. The season begins on September 21st. For over a decade during Halloween season the Cheeseman Fright Farm has been operating this wonderful haunted attraction. Tickets are $20. The attraction runs every Friday, Saturday, and Sunday night in October. Arrive early and do not keep the tractors waiting. The Haunted Hayride starts at dark. They run a haunted hayride, haunted corn maze, and haunted barn. During daytime hours they run a Pumpkin Fest family event on the farm. This haunted attraction opens on September 1st. “We will scare the living soul out of you.” Demon House will unleash the evil demons upon you. They run a special one night lights out glow stick specials .They are open 7 pm to midnight on Friday and Saturday or 10 pm on other nights. They are open every Friday, Saturday and Sunday nights in September and October. Plenty of scary fun starting on September 21st. One of Pennsylvania’s oldest haunted attractions, Dracula’s Forest has been open over 38 years. The featured attraction is the Haunted Hayride, and for small kids Little Screamers. New this year is the Dark Kingdom. Tickets are $15 for adults and $10 for kids. Combo with Dark Kingdom is $25. Open Friday and Saturday nights in September. Everything including fall festival is open in October. Runs in October every Friday, Saturday and Sunday nights. They also have a Not-So-Scary Hay Ride for adults and children on Sundays in October from 1 pm to 5. Their Halloween season begins on September 21st. Terror Behind the Walls is the name for the Halloween haunted attraction at Eastern State Penitentiary. Eastern State is a tourist attraction open every day of the year from 10 am to 5 pm. It housed over 80,000 prisoners in its nearly 200 year history. It is one of the most haunted placed on earth and paranormal investigators have conducted over 200 investigations over the years. Every fall Eastern State hosts Terror Behind the Walls as a massive haunted house featuring high startle, strobe light, fog machine, and high-intensity events. New experience this year is Blood Yard. It takes about 45 minutes to go through the haunt. You can also tour the history room that holds information about the prison and some of the most famous prisoners held inside. Parking is available on the street throughout the community or Ghost Buses run every few minutes to the Philadelphia Zoo nearby. Tickets are timed for half hour starts. It will still take perhaps 60 minutes in a waiting line. The place gets extremely busy. Prices for this haunt are based on the night you visit. Come early in the season and save money. If you are visiting the area or are local this is the one attraction you do want to visit at least once. They are open most nights in October. Terror Behind the Walls has over 67000 Facebook likes. An amazing haunt that opens on September 8th this season. Attraction is open every Friday and Saturday in September. Also open most Thursday, Friday, Saturday, and Sunday nights in October. Park opens at 6 pm and ticket booth closes at 10 pm. Everyone must be gone by 1:30 am. Field of Screams has 4 attractions plus an entertainment area. The combo pass is available. You can purchase individual event tickets also. The attractions are the Den of Darkness, Haunted Hayride, Frightmare Asylum, and Nocturnal Wasteland. Expect to find heart stopping horror attractions. You will experience demented creatures, blood sights, and bone chilling scenes. My favorite is their evening entertainment on the Bandstand. They feature a DJ, live band, or other entertainment acts along with games, food, concessions and souvenirs. Tickets are $16-20 for individual tickets or $30-35 for combo tickets. Field of Screams has over 70000 Facebook likes. The season begins on September 28th. Doors open at 7:30 pm and you can purchase October and November tickets for $5 less online. The attraction runs Friday, Saturday, and most Sunday nights. Check their web page for schedule details. They advertise themselves as the “scariest place in philly”. They are a high startle 25,000 square foot haunted house in South Philadelphia. Parking is free. Begin with the Festival Midway with music, celebrity appearances, concessions, face painting, bonfires, classic horror movies, and haunting entertainment. Then expect to be terrorfied in the Terror Maze, Paranoia, Frightmare Mansion, Hallow Grounds, and Dead End Hayride attractions. Now celebrating it’s 30th year of frightening folks. The General Admission tickets gets you into five attractions. Open most nights except Monday and Tuesday. Lots of special and discounts available. Entering its 30th season, Fright Farm is one of Pennsylvania’s top rated professional haunted attractions, with 5 distinct attractions; The Fest-Evil Midway, Hayride of No Return, Frightmare Mansion, Hallow Grounds, and a 2019 Surprise attraction! Our state-of-the-art special effects, highly-detailed scenes, custom digital soundtracks, computerized lighting, and talented actors make Fright Farm a frightening experience unlike any other. Fright Farm has over 25000 Facebook likes. The fun begins on September 21st. Attraction has 13 haunts. The 13 Levels of Fear are Clown Town, The Funeral Home, House of Evil, Haunted Hotel Conneaut, Zombie Hell, Last House on the Left, Carnival of Fear, Purple Haze, Demon House, Cabin in the Woods, The Devil’s Den, Museum of Horror, Blue Streak Ghoster Coaster. Doors open at 7 pm and close at midnight on Friday and Saturday. Doors close at 11 pm on other nights. Attraction runs Friday, Saturday, and Sunday nights. Ghost Lake says they are the largest, longest, and scariest haunted attraction in the world. You are advised to allow 2 hours to go through this attraction. Opens for the season on September 28th. A different haunt where you become part of the theater cast. Gravestone Manor is open every Friday, Saturday, and Sunday in October. Haunt is hosted by United Way of Wyoming Valley. They have hosted this event for 18 years. Tickets at the door at $10. On October 20th Camp Guyasuta puts on a one night Saturday fright featuring a hayride, haunted trail, zip line, climbing wall, and pumpkin patch. Online tickets save you money. Activities run from 3:00 pm until 9:00 pm. Souvenirs, food and snacks available for purchase. Opens up for the season on September 28th. It runs Friday, Saturday, and Sunday nights throughout October. The season opens on September 29th. HorrorFest has been called America’s most haunted farm. It a scary, real scary haunted place. Shady Brook is open year around with a daily farmers market, farm events, and wine music concerts. This is one of our favorite places to visit every fall. They put on HorrorFest every Friday, Saturday, and Sunday in October. Gates open at 7 pm. They have live music, bonfires, and food. The 4 thrilling scary haunts at HorrorFest are Hayride of Horror, 3D Alien Encounter, Carnage, and Barn of Horror. Tickets are $22 for one attraction, $27 for two, $32 for three or $35 to go through all 4 attractions. During the day consider attending their Pumpkinfest activities. Horrorfest at Shady Brook Farm has over 51000 Facebook likes. Opening night is September 22nd. There are three attractions at this haunted house. Altered Nightmares is themed after the rise of the damned. Hotel of Horror is an apocalypse look at the end of days. They are open every Friday, Saturday, and Sunday nights in October. Gates open at either 6:00 pm or 7:00 pm and close at 10:00 pm or 11:00 pm. Check website for additional September, October and November dates. The season begins on September 28th. A great value for only $20-23. They have a bonfire, refreshments, and concession stand along with 4 haunted attractions. Haunted Boarding House (evil in the hollow), Twisted Barn 4D ( a high startle graphic experience), Haunted Hayride and Toxic Swamp Walk, and Dead End Cornfield. Huston’s Haunted Hollow is open from dusk until 10 pm. Open every Friday and Saturday night in October. Opens this season on September 21st. This is a full entertainment complex featuring characters, new scenes, stories, and more horror for 2018. Six haunted attractions, live bands every night, music, games, celebrations, a theater and a mystery maze. The six haunts include Horrifying Hayride, Fields of Fright, Chambers of Horrors, Zombie Apocalypse, Lost in Jason’s Woods, and Carnival of Fear. This is a full night of entertainment. Expect to spend 2-3 hours or more to go through all the attractions. Opens every Friday and Saturday plus additional Sundays in October. Jason’s opens at 7 pm and stops selling tickets at 10:00 pm on Friday and Saturday or 9:00 pm on Sunday. Everyone with a ticket can go through the entire attraction so they close much later. Tickets are combo packaged. The three show ticket is $25. The five show ticket is $40. You get the mystery maze and Jason Wood Theater included with any ticket package. Parking is always free. Jason’s Woods has over 24000 Facebook likes. Attraction opens up on September 21st. Back again and even better for 2018. Five attractions based on 60 acres. Opens and runs Friday, Saturday, and Sunday nights. They have single attraction prices for $14-18 or a variety of combo attraction tickets starting at $40. Attractions include Terror Trail, Haunted Mill, House of Eyes, and Maws Crazy Maze. Generally opens at 6 PM. Sorry folks this popular annual haunted house has permanently closed. They will be missed. Opening night for the season is September 21st. Pennhurst Asylum is massive in size. It was built in 1908 as a fully contained dormitory, hospital, and prison facility for the mentally ill. Tickets for individual attractions are $20 or combo tickets start at $35. Attractions are Pennhurst Asylum haunted house, Dungeon of Lost Souls, Ghost Hunt, and Tunnel Terror. Legend has it that the facility was taken over 60 years ago by Dr. Chakajian. He conducted two decades of experimental surgery on convicted murderers, and rapists. At some point the inmates escaped and even now may be living in hiding on the grounds. This is one of the best haunted attractions you will ever visit. There are always new scenes and scares every year. Doors open at 6:30 pm and close at 10:30 pm on Friday and Saturday or 9:30 pm on other nights. Open Friday and Saturday nights in September and most Thursday through Sunday nights in October. Pennhurst Asylum has over 91000 Facebook likes. The Halloween season starts September 28th at Kennywood Amusement Park. Now celebrating over 17 terrifying years, Kennywood will once again operate Phantom Fright Nights. The weekend attraction is open every Friday and Saturday night in October plus two Sundays. This attraction is open from 7 pm until 1 am. Save with online tickets. They advertise intense spectacles of sheer terror with Biofear, Voodoo Bayou, Mortem Manor, Villa of the Vampires, and many more attractions. The fright events start on September 21st. Tickets are $45 but online coupons are available on their web page. Admission gets you into all four Reaper’s Revenge attractions. The Haunted Hayride brings you face to face with zombies and the Grim Reaper. Meet side show freaks and evil clowns at the Lost Carnival. Sector 13 is the experimental testing facility for Zombie research. Finally enter Pitch Black, a maze of blind darkness. The ticket office is open 6 pm until 11 pm on Friday and Saturday. Note the attraction closes at 1 am. It runs every Friday, Saturday and most Sundays in October. Check webpage for details. Reaper’s Revenge has over 27000 Facebook likes. Get ready for their September 14th opening night. “Pittsburgh’s Ultimate Haunted House”. Scarehouse is three haunts for one price. All parking is at the Pittsburgh Zoo or PPG Aquarium then ride the shuttle. The parking address is 7340 Butler Street. The attractions are Infernal, Nocturnia 3D, and the all new Sunset Lodge. Tickets are $16 online depending on the night. Reserve your tickets for half hour entry times. Consider Scarehouse as a living tribute to the Zombie capital of the world. Also for 2018 is The Basement. Here you will be touched, restrained, hooded and scared out of your mind. The Basement is something different for adults with high voltage effects, sexual content, water, live animals, and violent situations. Tickets are separate. Scarehouse is open Friday and Saturday nights in September and most Thursday, Friday, Saturday, and Sunday nights in October. This is considered by most as one of the top haunt attractions in the entire country. Scarehouse has over 80000 Facebook likes. Admission on $15. Open Friday and Saturday nights starting September 29th. Free parking. Wear appropriate outdoor hiking shoes and attire. Plan to be frightened. The fright season begins on September 29th. Sleepy Hollow has put on scary events for over 20 years. Combine dark woods, ghosts, eerie creatures, and nocturnal animals and you have a horrific show. Some nights there are live bands, bonfires, and refreshments. There are 3 haunted attractions open at 7 pm. They are open on Friday, Saturday nights and most Sundays in October. The attraction closes at 10 pm. Last Hayride on Sunday night is at 9 pm. Tickets are $16 for Sleepy Hollow Hayride, $16 for the Haunted House, and $16 for the Field of Fright. Buy the combo pass for all three attractions for $33. A ruthless business owner and his family were murdered in a violent worker uprising. Legend has them roaming the death marsh. Spookhaven serves food, beverages, and souvenirs along with scary entertainment. Spookhaven is open every Friday and Saturday night starting October 5th. See website for details. Lots of volunteer actors bring the ghouls, goblins, golems, vampires, and zombies to life. They have even created a legend. Held at the Masonic Temple. Started in 2013 as a fundraiser to benefit local organizations and staffed by volunteers, this is one of the area’s best attractions with 8500 square feet of haunted fun. Open Friday and Saturday nights. Not recommended for children under 8. Philadelphia and Pittsburgh have amazing haunted attractions. But if you don’t live near one of these two cities, you should also consider the options in neighboring states. Have you visited one of these haunted houses? I would be interested in hearing what you thought. Did you have a great experience? Was it worth the price? Would you suggest it to others? Any tips to maximize the experience? I’ll gladly publish what you send me and give you a super dooper hug. I’ve been to Eastern State several times. It’s always a great time. You can usually find $5 off coupons. Bates Motel and all their other attractions are great. It was the best I’ve ever seen. The exhibits at the hayride and the motel were so professional, it was like a Hollywood set. Very impressed. Erie, PA also had a Haunt that has been open for 3 years now. Eeriebyss: Factory of Terror. 2 levels of fear and fun. A no touch haunted house.